Pour 1 cup lukewarm water into a medium heatproof bowl and add 2 envelopes of unflavored gelatin. Stir and let rest until mixture puffs up, it will increase slightly in volume, about 3 minutes. Meanwhile, fill a small saucepan (that can hold the heatproof bowl) with 2 to 3 inches of water and bring to a simmer over medium-low heat. Place bowl with the gelatin mixture on top the saucepan, creating a water bath or double boiler. Let the bowl rest there, stirring occasionally, until gelatin completely dissolves, approximately 2 to 3 minutes. Remove from heat. Pour the sweetened condensed milk into a blender along with the mango chunks and lime juice, puree until completely smooth. Add the diluted gelatin and blend on low speed for a few seconds to combine. Pour into a large mixing bowl. Let it begin to set as you whip up the cream. In a stand mixer fitted with the whisk attachment, beat the heavy whipping cream until it holds soft peaks. Fold the whipped cream with the mango gelatin until fully combined. Pour into individual gelatin molds or ramekins, cover tightly with plastic wrap, and refrigerate until completely chilled and set, at least an hour. Alternatively you can pour it onto a container, and let it chill and spoon onto bowls later. 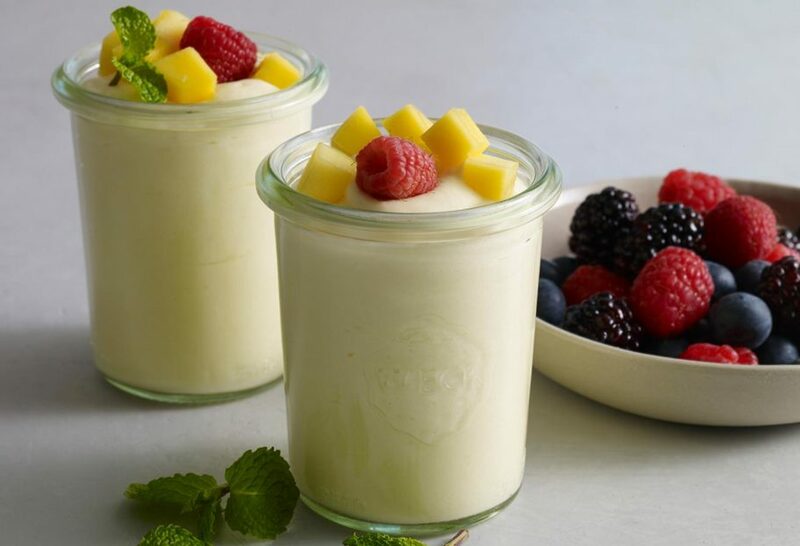 When ready to serve, remove from the refrigerator and decorate with diced fresh mango or berries of your choice, if desired. Or if chilled in a large bowl, spoon onto individual bowls. Can’t wait to try mango puff. We have 5 mango trees here in south Florida. and I am always searching for ways to use an abundance of mangos. Oh how lucky to have so many mango trees, Karla! Hope you love the Mango Puff. How much does each serving make? 1/2 cup? It depends on the glasses you use…I usually use a 6-8 oz glass or ramekin. Thank you for your yummy recipe, it has now become a must have at our gatherings, thanks a million!!!! I have made them with papaya and they are amazing!!!! What is a good substitute for the gelatin? Would chia work and how much? Agar agar? Just made this recipe with mangoes I froze when they were in season. Pati, your program is one of my most favorite cooking shows – lovely host, delicious recipes. Others in my family appreciate it, too. The first time my sister kept her three year old grandson overnight, he was missing his mom, so she asked him what they could do to make him feel better. He said, “Let’s watch a cooking show.” They turned on the TV and found an episode of “Pati’s Mexican Table” airing. This darling child found the additional comfort he needed, and made it through his first overnight away from mom just fine. Made the mango puffs yesterday, since mangos are on season here in CA, and I loved them. Love watching your show!!! Thank you so much for tuning in and for trying the recipe! Mmmm fresh mangoes! I’m from Indonesia, and this episode just came out last week (or maybe I just happened to watch it..hihihiii), anyway…can you share the youtube link for this recipe/episode. Hi Pati! My 11 year old daughter and I just found your program this summer and absolutely love you! You and your recipes are great! My daughter, Kristin, made the mango puff and we sandwiched some between graham crackers and froze them. Very yummy “ice cream” sandwiches! Hola Nellie, Thank you so much for watching! Great idea to make the mango puff into “ice cream” sandwiches!! So many! Apricots, peaches, papaya, berries, passionfruit, guava, mamey… your pick! Thank you for your fantastic program I look forward every weekend to watch you I wish the program was in the air every day I have learned so much from your cooking I love it . I am salvadorean I love your food I wish I can eat it while I watch you show . I admire you and your wonderful family you are an inspiration. God bless you. Same to you, Paola, thank you so much for watching. Thank you Pati for the nice dessert recipe.